About mid-November of this past year, I started thinking about the Mayflower and the pilgrims who made their long journey to this new land. How brave and determined they must have been! I can’t imagine the courage it took to make that first step onto the ship and seeing their homeland, with many family members left behind, fade from view. For most of them, it would be the last chance to look into the faces of loved ones. I, myself, get teary-eyed when I leave my daughter’s house in Connecticut to drive less than 5 hours to get back home, knowing I won’t be seeing them for another month or two. John Howland, a Mayflower passenger, was my husband’s 13th great-grandfather. It was reported that John fell overboard during the Mayflower voyage to the new world. Thankfully he was rescued by some sailors or you wouldn’t be reading this blog post! We wouldn’t have had the Bush Administrations, George number 1 or George Dubba-ya, because they were descendants, too. (You may have wished Mr. Howland would’ve drowned, depending on how you politically feel about the Bush years!) Anyway, young Mr. Howland was an indentured servant to Mr. John Carver, another Mayflower passenger, who became the first governor of the Plymouth colony. John’s age has been disputed, but we know he was a young man when he arrived in the New World. He was born in Fenstanton, Huntingtonshire, England to Henry and Margaret Howland. Two of John’s brothers, Henry and Arthur, also emigrated to Massachusetts at a later time. 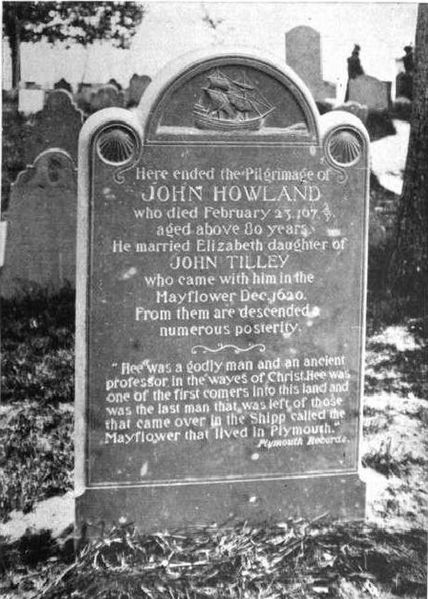 John married Elizabeth Tilley, daughter of John and Joan Tilley, all of whom were Mayflower passengers. Together, John and Elizabeth had 10 known children, who became the ancestors of many famous or notable Americans. John died in Plymouth on February 23, 1672/1673, having outlived all other male Mayflower passengers with the exception of one. Wikipedia has a pretty good article about the family with a small listing of notables. You can read it here. The Mayflower’s voyage was a long one, lasting about 66 days, and on many of those days, there were storms which caused huge waves to crash over the deck. In turn, one of the structural timbers broke and many of the weary passengers were called upon to help repair the beam. I can’t imagine the crowded conditions of about 150 people on a 100 foot ship! What about a lack of privacy, lack of bathing, food shortages, seasickness, crying children, fears of drowning or starving…not to mention there was no toilet paper back then or even a toilet, for that matter! My, oh, my! “Being thus arived in a good harbor and brought safe to land, they fell upon their knees & blessed ye God of heaven, who had brought them over ye vast & furious ocean, and delivered them from all ye periles & miseries therof, againe to set their feete on ye firme and stable earth, their proper elemente. And no marvell if they were thus joyefull, seeing wise Seneca was so affected with sailing a few miles on ye coast of his owne Italy; as he affirmed, that he had rather remaine twentie years on his way by land, then pass by sea to any place in a short time; so tedious & dreadfull was ye same unto him. But hear I cannot but stay and make a pause, and stand half amased at this poore peoples presente condition; and so I thinke will the reader too, when he well considered ye same. Being thus passed ye vast ocean, and a sea of troubles before in their preparation (as may be remembred by yt which wente before), they had now no friends to wellcome them, nor inns to entertaine or refresh their weatherbeaten bodys, no houses or much less townes to repaire too, to seeke for succoure. ..